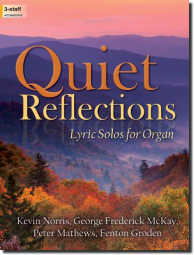 This anthology provides a wealth of meditative, lyric organ solos. These pieces are useful as preludes, offertories, interludes, Communion music, and recital selections, and various groupings can create music of varied duration. Fenton Groden's three preludes are inspired by psalm verses. Kevin Norris's exquisite "Six Lyrical Pieces" (with their echoes of Fauré's style) have been out of print for many years, and we are pleased to re-release them in new editions in this volume. Meditations by Peter Mathews and George Frederick McKay round out this exceptional volume of expressive organ music by American composers.